gvsavings1 has no other items for sale. Style: Demi Wispies. Includes: 4 Pairs on one tray. Look lustrous and beautiful without looking fake. Easy to apply. Love these! 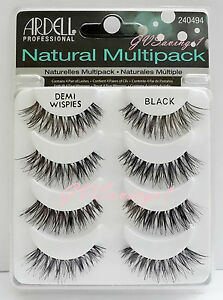 nice, soft and natural lashes! Goes with any look! My favourite false lashes, although there may be cheaper ones out there but that's when the quality starts to get compromised. These are great and great quality. Very easy to apply and trim to your eye shape. I use them for myself and on friends when I do their makeup! It's always a bargain to buy in bulk too! !